(Science, Technology, engineering, Art and Mathematics). Species from nearly every genus are either threatened, protected, or endangered. Little Tykes Camp introduces “STEaM Puppetry” which explores native Florida species, environmental concerns and stewardship, and storytelling through the art of puppetry. 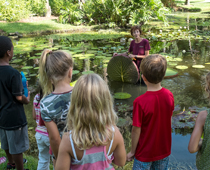 Social disciplines of STEaM will help our campers design and create puppets, build a puppet stage, compose an original play and perform for the patrons and staff of McKee Botanical Garden. Earth, wind, fire, and water represent what every species on planet Earth are made from and what they return to after death. The elements balance the cycle of nature. Campers will explore each of the classical elements through arts and crafts, disciplines of STEaM, representative animals (such as snakes, birds of prey, honey bees, turtles), biomimicry, and so much more. Campers take home a Foldscope, build an underwater ROV (remote operated vehicle) and design and build their own kite. Who remembers how much fun LEGO’s® were growing up? Live vicariously through your children’s exploration of LEGO in this week-long camp. Campers will engage in hands-on experiences of core STEaM concepts and link them to the world using LEGO bricks, coding tools, robots, and more. LEGO’s have an incredible ability to ignite a child’s natural curiosity, their creative spirit, and sharpen their scientific inquiry, engineering design, and data analysis. Our LEGO camp helps children realize their full potential as “digital citizens” and leaders of tomorrow! Note: Listed activities subject to change.